Male goldfinches in bright yellow are busy around weedy fields throughout the summer as they find seeds for themselves, their mates on the nest, and their young. In late fall and winter, when they are more likely to show up at bird feeders, the males have dull colors, more like females. American goldfinches are around to be seen in late summer, even though robins and red-winged blackbirds have already made themselves scarce in town. Why are goldfinches so noticeable now? It's high season for householding among our American goldfinches (Carduelis tristis). They build their nests and raise their young later in the year than most other birds, which usually start in the spring. 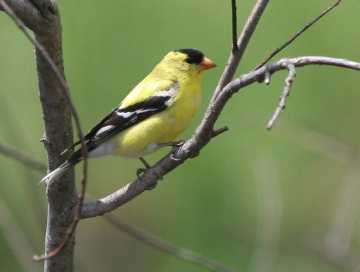 In mid-to late summer, from July through mid-September, the bright yellow black-capped goldfinch males and olive females are busy with their families. You might see goldfinches at your bird feeder in the winter, but at this time of year their business is elsewhere. Watch for goldfinches around the wooded edges of weedy fields, orchards, and roadsides as they fly between trees or shrubs. With its extensive fields, Mass Fish and Wildlife is a good place to look. Why do goldfinches nest so late in the season? The answer lies with certain thorny plants that are unwelcome to most people but a favorite among goldfinches – thistles. Goldfinches make good use of thistles in sheltering and feeding their young. In one use, goldfinches line their nests with thistle down, along with down from cattails. They're not so different from earlier generations of Americans, who filled their quilts with thistle down. A female goldfinch perches on a thistle, the favorite plant of goldfinches. They line their nests with thistle down and feed thistle seeds to their young. Goldfinches nest in the summer months when the thistle seeds ripen. Thistle plants also serve as food for caterpillars of painted lady butterflies (Vanessa cardui), and thistle blossoms are popular with many kinds of butterflies. 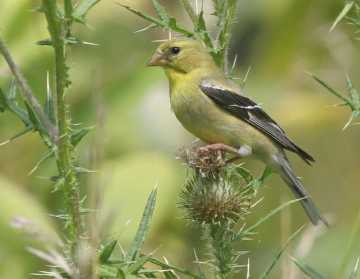 In another use, goldfinches feed thistle seeds to their young. Many other birds give protein-rich insects to their nestlings, even when these birds usually eat seeds or fruit for most of the year. But goldfinches raise their young on a largely vegetarian diet right from the start. The female gives the nestlings partly digested seeds for their first several days. Thistle seeds are a favorite. Most thistles bloom and go to seed late in the season, and the goldfinches' nesting is timed so that plenty of thistle seeds are around for their growing young. One good way to find goldfinches in August is to keep an eye on a big thistle plant. You can often spot goldfinches on the wing over a field by recognizing the pattern of their flight. You might notice a bird that flies over the field in a bouncing, up-and-down kind of flight, tracing a scalloped path through the air. That bird is likely to be a goldfinch. What's more, if you don't see a goldfinch in flight at first, you might hear it instead. The goldfinches often don't fly silently, but rather, chirp away during the upswings of their scalloped flight. Every few seconds there's a series of chirps or twitters. Follow the sound and spot the bird. Why do goldfinches chirp during these flights? You'd think these sounds would make the birds more obvious to a predator as they fly out in the open, just as the sounds make it easier for us to spot the little birds. It turns out that these chirps and twitters serve as contact calls – a way for one bird to keep in contact with its mate. When goldfinches pair up, they both alter their contact calls, adjusting them to be more like their mate's calls. Learning is involved, and goldfinches relearn calls when they change partners. Not all birds can do this. The similarity in calls helps mates recognize and keep track of one another in a flock or at a distance. Goldfinches raise one or two broods during their nesting season. The female of a pair typically builds the nest while the male watches, and she sits on the eggs. The male feeds her while she's on the nest. The young hatch after about two weeks, grow quickly, and leave the nest after another two weeks or so, but they're not yet fully independent. They still need the parents to feed them as they learn to fend for themselves. At this point, time is short if there's going to be a second brood during the summer breeding season. Some goldfinches solve this problem in a surprising way. The male stays with the young that have left the nest and keeps on feeding them for another three weeks. The female builds a new nest and starts a second family with a different male. Fortunately, goldfinches are fairly sociable birds. They do not seem to be territorial or aggressive. If you see one pair, you're likely to find a few other pairs in the vicinity during the breeding season. In the winter, goldfinches move around in large flocks, sometimes joined by other kinds of birds. They don't necessarily migrate.